Walking across the Brooklyn Bridge has become one of the top tourist activities for visitors to New York City. But as with any major tourist attraction, there are tips for a Brooklyn Bridge walk. If you want to look like a local check out these ten tips to enjoy the trip. Do plan to spend at least an hour in each direction, so there’s time to stop and look. The Brooklyn Bridge has a few spots where you can read historic plaques. You can also take a guided walking tour of the Brooklyn Bridge. There are many informative walking tours that focus on different aspects of the bridge's history. If you want to impress your friends, have these facts about the Brooklyn Bridge handy. Do bring your street smarts: Go during daylight hours, or any evening when there are lots of other pedestrians. Although there is a strong police presence on the bridge, it isn't wise to travel across the bridge in the middle of the night or at off times. In the warmer months, the bridge has more pedestrians than in the winter. However, if you find the bridge to be desolate, you should consider walking across it at a time when it's a bit safer. Do wear comfortable shoes and not high heels. The planks of wood will catch small heels, but it's also a rather lengthy and often windy walk across the bridge, and you don't want to focus on your feet but rather the architecture of this historic bridge and the insanely captivating views of Manhattan and Brooklyn as you stroll across the bridge. Do realize that it’s a 1.3-mile walk, perhaps longer than you (or your children) expected. If you have kids in tow, you might want to just walk across a small portion of the bridge and return to lower Manhattan or Dumbo. If you do brave the 1.3-mile walk, bring snacks and stop to take pictures. Allowing your child to use your phone to take their own photos or purchasing a disposable camera for them to use for this journey, might be enough incentive for them to make it across the bridge. Also, if you have a stroller, you must be patient as you weave the stroller through the foot traffic on the bridge. Do take a moment to get a photograph of the Manhattan skyline. This might seem like a no-brainer, but do stop and take pictures. It's a simply stunning view. Do stay in the pedestrian lane. If you get within an inch of the bike lane, most likely you will hear a cyclist shout at you to keep out of the bike lane. The cyclists go pretty fast, so it's best to avoid the bike lane. Do pay attention to all the traffic. Watch for cyclists who might be riding in the pedestrian lane and people stopping to take photos. Don't expect to find bathrooms, food vendors or water available on the Brooklyn Bridge. There are no bathrooms, food or water on the bridge, so be prepared. Don't climb the Brooklyn Bridge. DON'T! This is extremely dangerous and utterly foolish. Don't walk across the Brooklyn Bridge in inclement weather. The bridge gets very windy, so unless you are prepared for the wind, and complete exposure to rain and snow, take the trip when it's nice out. Don't forget to take pictures. If you do have a selfie stick, please be mindful of others when you take pictures. 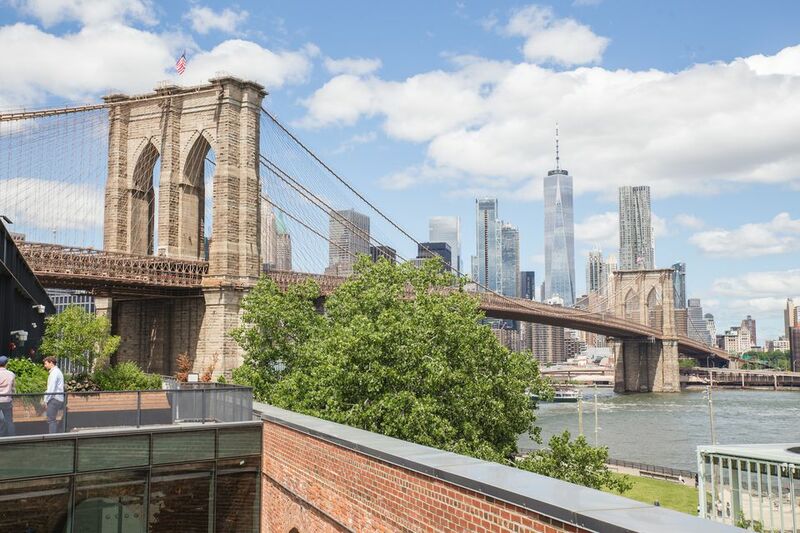 Once you cross the bridge into Brooklyn, you will be blocks from the chic shopping in Dumbo. Try to schedule ​time to explore this once Industrial neighborhood that's home to galleries, trendy restaurants, and cafes, as well as a gorgeous waterfront park. Here's a Visitors Guide to DUMBO to lead you on your DIY walking tour of this vibrant Brooklyn neighborhood.